Regular passengers on the 08:41 train leaving Edinburgh Waverley on Saturday 22nd October may have noticed that their service was busier than usual, as ethnomusicologists from around the UK and abroad made their way across the Firth of Forth to attend the BFE's latest one-day conference. 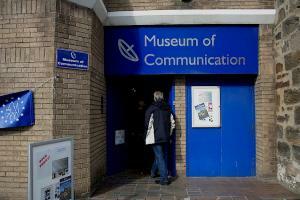 Although the conference was organised by the Reid School of Music at the University of Edinburgh, the event itself was held outside the city at the Museum of Communication in Burntisland, a small Fife coastal town in the shadow of Craigkelly Transmitting Station, which transmits commercial and Gaelic-language radio across central Scotland. 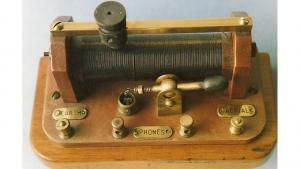 Radio has been one of the twentieth century's most important technological innovations. It has frequently shaped not only the production and consumption of music, but also music's capacity to underpin notions of community, nationhood, and many aspects of individual and group identity. Yet as a medium of musical and intellectual communication it remains under-researched compared to other technologies, such as sound recording. 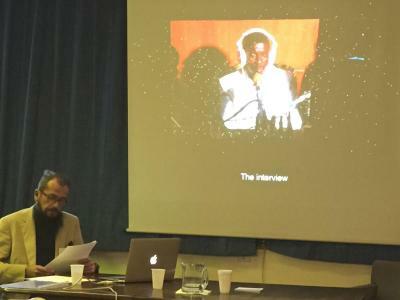 The conference began with a panel entitled 'Broadcasting Beyond Borders', which showcased recent research on diaspora music-making and transnational musical revivals. Focusing on the performance and broadcasting of Cornish Christmas carols by Cornish mining communities in Grass Valley, California, Elizabeth Neale (Cardiff University) showed how 1940s radio programming consolidated key elements in narratives surrounding Cornish choral traditions, while also helping members of diaspora communities reposition their identities within broader notions of Californian and American identity. The transatlantic flow of music was reversed in the next paper, in which Lawrence Davies (King's College London) examined how early 1950s BBC radio broadcasts by the American folklorist Alan Lomax introduced new ideas about the history and development of jazz and blues to British audiences. Yet, Davies argued, Lomax's reliance on extant patterns of transatlantic musical and intellectual exchange when writing and recording these programmes suggests the need to understand the specific appeal of radio's sonic and dramatic potential for Lomax's research activities. The final paper in this panel returned to Cornwall, as Lea Hagmann (Universität Bern) examined how the recording of a 2013 episode of Music Matters at Perranporth for BBC Radio 3 became a flashpoint for Cornish music revivalists' competing claims of authority over the tradition. Hagmann showed how debates around the relationship between 'Cornish' and 'Celtic' musical identities map to the now multigenerational Cornish music revival, raising the need to consider the existence of multiple and competing 'revivalist' impulses that often lie beneath claims of a tradition's coherence. The next panel, 'Selecting Music for Radio' focused on industry approaches to music production and dissemination. Katrine Wallevik (University of Copenhagen) discussed her recent ethnographic research into pop music programming at Danish Broadcasting Corporation, explaining how decision-making processes used by prominent broadcasters at the station, while often mystified in public debate, rely on a number of cultural models mediated through the station's production software and digital music library. The changing role of radio in light of recent developments in digital music services was the subject of Mark Percival's (Queen Margaret University) paper. Revisiting earlier doctoral research conducted before the advent of digital music streaming, Percival examined how networks of industry 'song pluggers' have needed to adapt radio's role in the dissemination of new music in order to weather changing patterns of music production and consumption in the digital age. The final paper in this panel, by Kristine Ringsager (University of Copenhagen), discussed the production of 'world music' programming on Danish Broadcasting Corporation radio. Rather than examining broadcast music, however, Ringsager interrogated more complex issues surrounding radio presenters' voices and their role in representing cosmopolitanism and 'Otherness'. During a well-provisioned lunch, conference attendees took advantage of the break in proceedings to look round the Museum of Communication's extensive collection of historical radio technology, much of which is maintained in full working order. Many sets in the collection demonstrated radio's unique facility to cross national borders by indicating broadcast frequencies for stations as diverse as Scandinavia, the Mediterranean, and North America. In stark contrast to these devices was the austere 'people's radio', produced in Nazi Germany. Modified to restrict listening to German stations only, this device offered a sobering reminder of how radio has also been used to coerce and control. The afternoon session began with the conference keynote. Prof. Timothy Taylor (University of California Los Angeles) examined the need for a more nuanced consideration of the circulation, value, and exchange of music in the context of radio broadcasting and consumption. Taylor warned against the uncritical usage of common metaphors like 'flows' and 'circulation', recommending instead that we examine the specific dynamics of movement in the areas we are researching, and in particular their relationship to notions of value. Revisiting not only hallowed theorists like Marx and Gabriel Tarde, but also contemporary economic thinkers such as Anna Tsing, Taylor explained how cultural goods and forms of capital move through a system of constant exchange. Through fieldwork conducted on the indie rock scene in southern California, Taylor traced the role of radio as a site of such exchanges between musicians and audiences, and reflected on broadcasting's continued relevance in structuring cultural workers' ideas about exchange and value in the digital age. In our afternoon panel, 'Mediating Place', we returned once more to radio's power to construct national and regional identity in music. Helen Gubbins (University of Sheffield) drew on recent archival research to examine how 1930s broadcasts from Renfro Valley, Kentucky helped to build notions of Appalachian regional identity. As with Neale's paper earlier in the conference, Gubbin's research explained how the production of musical identities on radio relied on techniques intrinsic to the medium such as location recording, as well as the assertion of particular narrative tropes regarding everyday life and music-making amongst the inhabitants of early twentieth-century Appalachia. Lonán Ó Briain's (University of Nottingham) paper reported on a recently commenced project investigating the role of Voice of Vietnam Radio in the formation and maintenance of the nation state. Drawing on interviews with some of the station's early employees, Ó Briain traced how the station's musical activities have underpinned the dissemination of political narratives and public culture in Vietnam since independence and through the country's recent economic liberalisation. Theodore Konkouris (Queen's University Belfast) provided conference attendees with a though-provoking reflexive narrative of his research amongst hunter-musicians in Bamako, Mali. Konkouris showed how radio programming has facilitated the national transmission of otherwise localised musical and social rituals, intersecting with broader issues of morality and identity in contemporary Malian life. The final speaker of the day was Rebecca Draisey-Collishaw (Memorial University of Newfoundland), who addressed the performance of multiculturalism in the Canadian music series Fuse between 2005-8. While the series ostensibly offered a site for reconfiguring existing cultural and social divides through musical interaction, Draisey-Collishaw demonstrated how the program could also unwittingly reinscribe these divisions through its musical categorisations, production decisions, and through failing to contest common tropes in guest musicians' own mythologies of music and identity. This one-day conference brought together a broad range of research from ethnomusicologists at different levels of their careers, demonstrating the conference theme to be a fruitful area for research. The emphasis on music and identity found in this year's papers will hopefully be balanced by further ethnomusicological scholarship on the act of radio listening itself, as well as the explicitly technological aspects of broadcasting. Thanks to organisers Dr. Annette Davison, Prof. Simon Frith, Dr. J Mark Percival, Dr. Tom Wagner, and Dr. Tom Western at the University of Edinburgh; and to the staff and volunteers of the Museum of Communication, Burntisland, for a successful and thought-provoking conference in an ideal setting.